A recent research study by Transparency Market Research projects the market for monoclonal antibody therapeutics to attain a value of US$245.8 bn by the end of the forecast period in 2024 by rising at a solid double digit 12.6% CAGR from 2016 to 2024. The estimated valuation of the market as per our report was US$86.7 bn at the start of the forecast period in 2015. Monoclonal antibody therapeutics mostly find application in treating autoimmune diseases. This is because of the rising awareness about such diseases and their treatments, better accessibility to healthcare, and the growing applications of monoclonal antibody therapeutics on account of major thrust on their research and development. Going forward too, the rising cases of autoimmune diseases expected to generate maximum opportunities in the market. 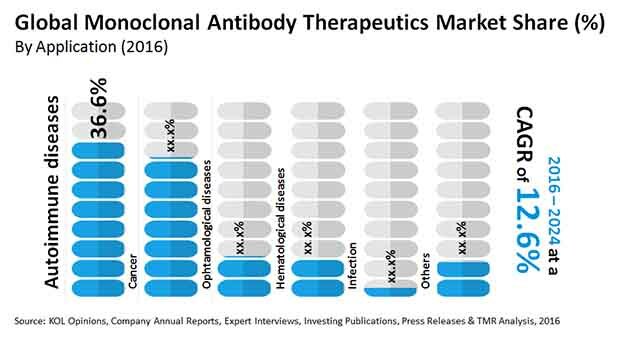 From a geographical standpoint, Europe and North America together accounted for a share of 62.7% in the global market for monoclonal antibodies therapeutics in 2015. Their market has been stoked by the rising number of elderly, solid reimbursement policies and affordable healthcare, and a strong knowledge about various diseases. Monoclonal antibody therapeutics is essentially a biological therapy that finds usage in treating different kinds of chronic conditions. Rheumatoid arthritis, cancer, Crohn’s diseases, osteoporosis, systemic lupus erythematous, and psoriasis, among others, can be treated leveraging the therapeutics. Monoclonal antibodies target just the affected areas to annihilate the diseased cells, thus helping the immune system to rebound. The surging cancer cases worldwide is a major driver of the monoclonal antibody therapeutics market. As per the WHO, cancer cases are expected to rise by 70.0% in the next couple of years and this will spell immense opportunities for the market. Apart from rising cases of cancer, investments into research and development of new antibodies, especially in the U.S. and Europe, along with speedy approval and commercialization of these drugs will also contribute to the surging revenue in the market. Our report finds that around five to six monoclonal antibodies receive a nod from regulatory bodies in these regions every year for launch in market. Despite the bright potential of the market, it is expected to be hobbled by the growing manufacture of biosimilars, which also find application in treating different autoimmune diseases and chronic conditions. In addition, expiry of patents for many monoclonal antibodies coupled with expensive and complex manufacturing process is hampering market growth. All such factors are serving to drive up prices of the final product thereby dampening sales.